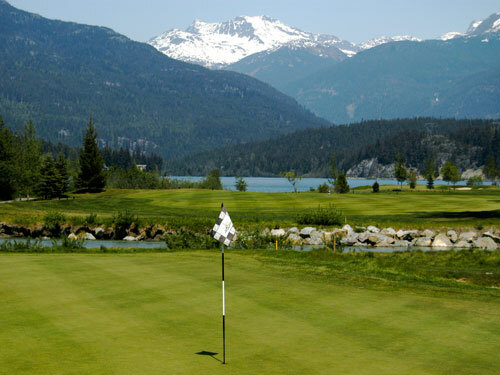 Golfing in Whistler, British Columbia offers a perfect combination of great golf and the beauty of the Canadian Rockies. WHISTLER, BRITISH COLUMBIA-Canada-Whether you’re looking for a golf vacation filled with challenging courses or a laid back miniature golfing route, Whistler, British Columbia offers the perfect blend of great golf against a backdrop of beautiful Canadian Rockies scenery. Whistler has been blessed with a setting of such outstanding natural beauty that even a game of mini-golf here would be one of the most memorable games of your life. 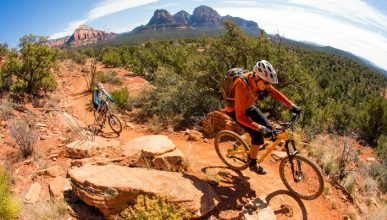 Towering snow-capped mountains, shimmering mountain lakes, sparkling creeks, pure cobalt skies – everywhere you look there is a kind of pure and pristine natural beauty that is becoming rarer. Just being in such a setting is therapy for the soul, so imagine how amazing your golfing vacation will be! Fortunately, Whistler golf vacations are as fabulous as the scenery. You have your choice of four top-rated, award-winning courses within minutes of Whistler Village. Designed by such luminaries as Jack Nicklaus, Arnold Palmer, Robert Cupp, and Robert Trent Jones Jr., each course has its own unique character, not to mention challenges. Whistler was the site of the 2010 Winter Olympics and as such is a world-renowned ski resort with accordingly world-class amenities. Whistler Village itself has a compact, pedestrian-only town center, where luxurious hotels offering elegantly sumptuous accommodation are complimented by many fine restaurants. With a choice of over 90 dining places, all with-in easy strolling distance, you’re sure to find a dining experience to suit your tastes. After dinner, you will find a diversity of entertainment options such as nightclubs, piano bars, live theatre, cinema, or art galleries. Whistler has something for everybody. Other off-course essentials like shopping and pampering are also well looked after. There is a wide range of shops and boutiques- whether you desire high fashion apparel, jewelry, unique native art, or even golf equipment, you’ll find it somewhere in Whistler Village. Spas are becoming increasingly popular with both sexes, and with over twenty spas, Whistler has one to suit every taste. Everything from aromatherapy to yoga is readily available. Some spas even offer a ‘couples packages’, so you can relax and unwind together after a hard day on the golf course. The best part about a Whistler golf vacation is the overall friendly, laid-back ambiance of the place. The service is still comprehensive and efficient, but delivered in an unobtrusively friendly manner by people who care. It must be that the spectacular scenery, the crisp mountain air and the pure water have a soothing effect on everyone. While planning your Whistler golf vacation, check out GolfCanadasWest.com. For all your BC travel needs, be sure to visit VancouverCanada.com and BCCanada.com, and get a free copy of the helpful guides and BC maps provided by the official tourism authorities of Vancouver and British Columbia.